Start out on the Coffee Pot Hollow Trail on the west side of the parking lot entrance. Take the Spruce Trail to Laurel Path to Kissinger Road to Owl Trail to Piliated Trail. Take Buck Hollow Trail to the southern end of the park, double back, take Buck Hollow Trail to Chestnut Trail to Painted Turtle Pond. Take Chestnut Trail to Oak to mansion. 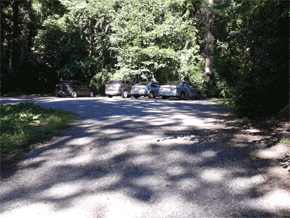 Take road to Watershed Trail, follow to Sheerlund Trail to Coffee Pot Hollow Trail back to Oregon Road parking lot.